Another perspective on the law firms that were ranked highest on M&A deals is to look at the average size of the deals they worked on. That data appears in the following plot. 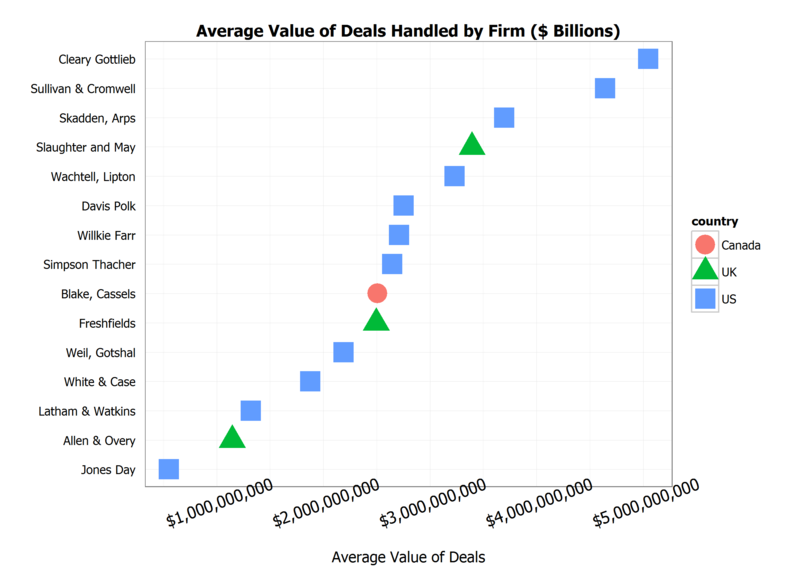 The X-axis shows average deal size in billions of US dollars. The plot adds another piece of information: the home country of the firm. To do so, the software alters both the shape of the “point” and its color for each law firm. An example is the Blake Cassells, the only Canadian firm in the group, and thus the only one in red and with a circle. At a glance you notice that the two firms in the top right, Cleary Gottlieb and Sullivan & Cromwell, have had a “fewer but bigger” set of clients; by contrast, Jones Day in the lower left appears to churn through many more deals but much smaller ones.